Anger can be a challenging emotion to work through. Sometimes our anger can be frightening. Or, maybe we consider it inappropriate to even feel this way at all. Not only that, when anger is misdirected, it often leads to poor choices, damaged relationships, and even violence. So what’s really going on in the brain and body when anger is triggered? Next: How Anger Affects Your Brain and Body, Part 2 – How Stress Hormones Can Change Your Brain. Now we’d like to hear from you. What have you found to be helpful in working with anger? Please leave a comment below. I work as a psychologist, work with trauma survivors and take great time in educating my clients in how the mind and body works. It is a big step in reducing shame. I am so excited to use these with my clients. I will come back and tell you how it works. One question, some of my clients do not speak English, is it ok for me to translate the infographics? I will make sure your copyright information will be on the Icelandic version. Have you utilized genetic testing to find genetic SNPs? In some people, nutritional deficiencies can block optimal brain function. More reputable and affordable testing companies are entering the market, you want to select one which interprets for nutritional deficiencies and offers suggestions. Note: just because someone has a genetic SNP doesn’t automatically mean there will be a nutritional deficiency, but the risk is there especially if the body is stressed and isn’t fed a wholesome diet. It is a great subject to discuss even if my English language my second language. It is clear and very interesting because more and more people suffering. People shy to talk about it or so busy.I just happy to read about it and share with friends. Here in this game game have no chance for the cheating because here http://spidersolitaire1.doodlekit.com in this game gamer have so more online viewer. Amazing! Thank you. A Canadian Mental Health Association (CMHA – WW) we run and Emotional Regulation Group that helps clients to understand the physiology around trauma. These resources are excellent and help clients to understand complex systems. It HELPS reduce the shame – My new mission as a therapist! My experience receiving your descriptions of theory and practice is that it feels more like a marketing blitz. There are many behavioural medicine practioners vying for the same consumers in the same way and it just leaves a really bad taste in my mouth. It’s an industry. L I have years of experience in mental health, both as a professional and as a consumer. I have always seen the disparity in what is available to who and it comes down to money. I can not afford your product. Instead I search for information that is freely given. I am sure I am not alone in this. It’s a trust thing as well ……what are your true motivations. Why don’t you cut down on the number of “experts” your program offers trying to support their practice and change your business model where your revenue comes from donation. And be available to all. The spiritual component of giving away that which you were fortunate to receive. In summary I can’t afford your program especially when I question the structure of it. This post has taken some courage to write on my part as may produce negative feed back. Possibly I speak for others? I believe Marny is saying that your programs for people that need help ate too expensive for the public and if you changed the business model to benefit every one. I have been through many traumas and wish I could go to people like you that understands how trauma effects the brain and body and now that I have read some of it and reading the charts helped me understand why Ive had and still am having physical and emotional problems. I have to deal with this alone and I wish I had the help I deserve. My daughter suffers anger that is off the charts and her psychiatrist is ill-equipped to deal with it. In response, he tells her he believes the Rx mix they’ve achieved is perhaps the best they’ll be able to do. Meanwhile on bad days she harbors and festers and screams that she just wants to die. I am at a loss to know what to do though I have been her staunch supporter for years, whereas her father threw up his hands years ago and stays out of contact with her, upsetting her all the more. I would give anything to find something of benefit to her. Her life has been so hard she believes God’s desire is only to torment her. Because of this, at age 35 she is unable to live alone or manage life’s stresses, so we carry on together in a circle of non-progress, though not for lack of love or effort. You may want to purchase the lecture series and listen together. Or, watch for the free videos and free reports nicabm publishes. I am an art therapist, and trauma survivor (multiple times over), and this information is some of the best that gets to the deep seeded wounds that are not recognized by a system of “managed care.” Rage is a natural reaction to trauma, and a healthy one… even though it can quickly go out of control. What happened that she is responding with rage? What needs to be addressed so she can begin to let go of the pain and heal? She may not know, but she might know exactly what has gone wrong for her. The techniques used by these masters are very powerful, and not prevalent in the “mainstream” of mental health, although becoming more so. 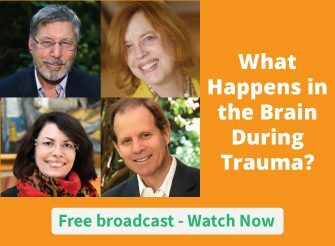 They are the best of the best material we use in trauma recovery work. I would also suggest that, as you listen together, and watch which clinician’s work seems to strike a chord with her, that you reach out to those masters, to see if they would be willing to work with your daughter in a workshop setting, to show learning clinicians how the practice works. Sometimes they will do this for free, because you are brave enough to out yourself and your problems, bearing your soul in front of an audience. I feel for the situation that you and your daughter are in. I can only pass on what has assisted in dealing with trauma that may be of some benefit. Dealing with a parent that was absent emotionally at a young age can generate strong emotions, these emotions have a life of their own as they operate from the unconscious and this can confuse a person as they feel helpless in controlling their behaviour. I found getting in touch with my body sensations as a way of connecting with the subconscious, strong emotions are linked to past events and the emotion generates a physiological response, by generating awareness of the sensations you can reflect on thoughts or events that triggered the sensation. You daughter will need a trained therapist to support and assist healing and help ease her into the places she has been protecting herself from, places that may be outside her conscious awareness or have been previously to overwhelming to go into. I found breath work, mindfulness and yoga as good places to start with re-connection to the body. Given her father has given up on her physically maybe it happened emotionally way before, and being alone is too stressful. This could be a place to explore. I am very grateful for this resource. It’s beautiful and useful!!! Thankgyou for the great visual. It’ll be far mor fun and easier for my clients to grasp than my line drawings. Excellent pictorial representation of common triggers, and the subsequent secretion of neurotransmitters ; good for clinicians and therapists, fabulous for patients! I would imagine it is the same response to pain/chronic pain? Great to have a visual like this. Very useful for counselling.